Epically Creamy Mac and Cheese with Butternut Squash - Stovetop or Baked! This Creamy Mac and Cheese with Butternut Squash is a perfectly cheesy and creamy side dish for your Thanksgiving table. With a sweet hint from the roasted butternut squash, this is a delicious way to serve macaroni and cheese even outside of the holidays. If you’ve been on my site before, you’ve probably heard me talk about mac and cheese a time or two. I love it. It’s my absolute favorite. When people hear I went to culinary school I usually get asked, “What’s your favorite thing to cook?”. Due to its simplicity, they’re always a bit shocked when I respond with “Mac and cheese” It’s the ultimate comfort food. Who doesn’t love a delicious homemade macaroni and cheese? It feels decadent and special to eat a homemade version, and that is partially why this is such a great recipe. It meets the criteria for something special by using a unique cheese mixture instead of typical sharp cheddar, it adds in an autumnal flavor profile with the addition of the roasted butternut squash, and it’s a surprisingly easy mac and cheese recipe to make. The ingredients do most of the work for you. Check out my completely free ebook with 21 Macaroni & Cheese recipes here. Whether you regularly make homemade mac and cheese or you are a connoisseur of Kraft, get ready to take your game up a level with what is quite possibly (in my very biased opinion), the best mac and cheese recipe in my recipe box. To make this Creamy Mac and Cheese with Butternut Squash recipe to absolute perfection, I recommend brushing up on these cooking skills and techniques. If you want to make this butternut squash pasta recipe without the roux (flour and butter) keep reading for the alternative. Also, a bit further down I give you my tips on how to turn this into a baked mac and cheese recipes, as well as how to make stovetop mac and cheese for a crowd. How To Make a Roux. As with any pasta with white sauce, you need a fantastic roux to create the correct sauce consistency. Find out how to make the perfect roux and how to correctly incorporate your milk so the sauce doesn’t clump. How To Make A Béchamel Sauce. While we aren’t doing a perfect béchamel sauce for today’s Creamy Mac and Cheese recipe, it does have some really helpful tips for making dairy based sauces. Can You Bake Stovetop Mac and Cheese? As with any good comfort food, yes this can be turned into a casserole style baked butternut squash pasta recipe. For the best success, make your cheese sauce soupier (add one extra cup of milk) and generously top the baked mac and cheese grated cheese. While it may be tempting to use the sharp cheddar in your refrigerator, it will throw off the flavor profile of this dish. The English Coastal Cheddar and Parmesan may not get as bubbly as the sharp cheddar, they do still create a gloriously flavorful crust on top. To turn this stovetop mac and cheese into baked mac and cheese you’ll need an extra 8 ounces of grated Sharp English Coastal Cheddar. Follow these instructions. Boil the pasta to one minute less than the recommendation on the packaging. Make the sauce according to the directions, but add one extra cup of milk. Toss the macaroni with the prepared sauce and pour half of it into the bottom of the pan. Layer half of the extra grated English Coastal Cheddar then top it with the rest of the sauced mac and cheese. Top the baked mac and cheese with the last of the grated cheddar English Coastal Cheddar cheese and bake for 15 minutes or until the cheese is bubbly and starting to brown. Note: One of the staples of baked mac and cheese is bread crumbs. If you would like to add that extra crunch, I recommend toasting one cup of bread crumbs with melted butter and one teaspoon of Italian seasoning or ½ teaspoon garlic powder. For a truly autumnal twist, try adding ⅓ cups of chopped toasted pepitas (pumpkin seeds) to the bread crumbs. Whether you’re making this ahead, or you have leftovers, it is easy to reheat this creamy mac and cheese. It will only stay fresh in the refrigerator for up to 5 days (if stored in an airtight container) so make sure to eat it within that time frame. Preheat the oven to 350°F and place the macaroni and cheese in an oven safe dish with a lid or aluminum foil on top. Bake for 20-30 minutes or until reheated. Reheating times will vary based on how shallow or deep your bakeware is. If you chose a deep dish, stir the Creamy Mac and Cheese with Butternut Squash halfway through to help reheating. Optional: If you would like to make your leftovers look fresh, add an extra layer of freshly grated cheese on top before baking. Stir in about ½ cup of milk to the leftovers; just enough to loosen the macaroni and cheese. Place the mac and cheese in a heavy bottomed pot over medium low heat and cook until heated through. Stir it very regularly to prevent scorching. Add extra milk as necessary to loosen the macaroni and cheese, but be careful not to add too much at the beginning. The roux keeps the sauce from completely loosening until it is almost at boiling temperature so give it time before overloading it with extra liquid. 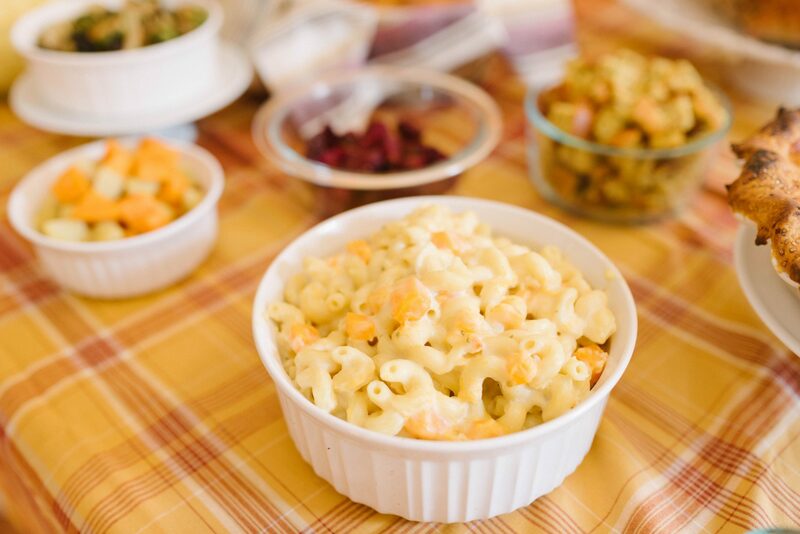 This easy mac and cheese recipe sounds and tastes fancy, but is a great recipe to whip up for a Thanksgiving or Holiday crowd. With the extra addition of veggies with the butternut squash, it makes for a fantastic side dish to bring to a potluck or serve at dinner. Heck, you could add some chicken to it and easily turn it into an entire meal. If you want to make this stovetop creamy mac and cheese recipe for a crowd though, the only hindrance is a pot large enough. Doubling the recipe requires at least 8 quart pot. If you want to go beyond that, then you’ll probably need to work in batches since most homes don’t have a large enough pot. Remember, if you plan to make this recipe for a crowd, then you’ll want to make sure to have an 8 quart or larger serving vessel for presentation (assuming you don’t want to just dish up out of your pot). For anyone that is gluten-free or is desiring to steer clear of a roux, yes you can make this mac and cheese without flour. However, the sauce needs a bit more time and attention because you will need to let it reduce to achieve the same consistency. This comes with it’s own challenges; specifically preventing scorching and adding the cheese at the right time. Bring 8 (not 6) cups of milk to a light simmer and let it reduce by one third. This will thicken the milk to the equivalent of a light roux. Make sure to stir it very regularly (read: almost constantly) so you can feel if the temperature is getting too hot and the milk is getting ready to scorch. You’ll know that point when the it feels like your spoon is scraping something thick and bumpy on the bottom of the pot. Follow the rest of the recipe as written. If you add the cheese in before the milk has reduced enough, it will increase the chance of the sauce scorching. The main question I get when it comes to how to make mac and cheese without flour / butter / roux is whether or not the reduction of the milk is necessary. No, it is not. However, the consistency will be creamier if you do. You can achieve a similar result by using a 1:1 ratio of milk to heavy cream, but the cream makes the sauce sweeter. What Goes With This Creamy Mac and Cheese Recipe? If you want to make this as a main dish for your dinner, you can easily add in a protein to round it out. Personally, I love chicken or a sweet apple sausage. Also, you could add bacon (use the bacon fat instead of butter to make the roux!). I mean, who doesn’t love mac a cheese with bacon? This easy butternut squash pasta recipe is kid-friendly and mom-approved because it’s a great way to sneak in extra veggies. Not only that, but it has a secret weapon cheese that rounds out the flavor and makes it epically creamy! English Coastal Cheddar is a naturally yellow cheese with a streak of white calcium crystals running through it. This provides a uniquely sweet and slightly nutty flavor profile for the cheese and really rounds out the autumnal flavor of this mac and cheese. There aren’t many brands that make English Coastal Cheddar, so If you can’t find it, look for a strong cheddar that has visible salt crystals in it. (You can usually find these in the specialty cheese case at your local grocery.) This will give you the best flavor for this macaroni & cheese. Want a free printable grocery list for this Super Creamy Mac and Cheese recipe? Get it HERE. Use this grocery list to help simplify shopping. Everything is listed in standard grocery store amounts. If no size is specified, even the smallest package will provide more than enough. Don’t forget to add any extra ingredients like bread crumbs, extra cheddar cheese, or extra milk if you decided to make this a baked mac and cheese. Scroll up to the get my recommendations for extra ingredients for both of these options – they’re listed in italics. Epically creamy and flavorful, this creamy mac and cheese with butternut squash recipe is easy to make, done in an hour, and soon to be a new family favorite. In a bowl, toss the peeled and cut butternut squash with just enough olive oil to lightly coat it. Salt and pepper the butternut squash to taste. Cook for 20 Minutes , or until the squash is al dente. Set aside. While the butternut squash roasts, Cook pasta according to the package. Set aside. In a large sauce pot, heat the butter over medium until melted. Add in the flour to make a roux and cook for 1 Minute or until the roux becomes chalky and frothy. Slowly whisk in 1 cup of the milk, being careful to completely whisk out any clumps of flour that form. Note: the slower you whisk in the milk, the fewer clumps will form. Whisk in the rest of the milk and bring to a simmer. Cook for 20 Minutes or until the sauce has thickened enough to lightly coat the back of a spoon. Stir every few minutes to make sure the milk isn't burning to the bottom of the pot. Stirring constantly, add in the Boursin Garlic & Fine Herbs cheese until melted, then add the gratedEnglish Coastal Cheddar and grated parmesan until melted. Add in the cooked cavatappi pasta and roasted butternut squash and stir until it is well coated. Season with salt and pepper and serve. Adapted from a recipe my local Trader Joe's passed out. This looks so creamy and smooth… with the squash cubes, I’ll bet it tastes as good as it looks! Thank you so much, Amy! 🙂 Also, that bread is addicting and useful for so many things. I love using it for leftover turkey sandwiches after Thanksgiving! I really love the idea of adding squash to mac n cheese. It’s been on my to try list for far too long! It’s so good and addicting Choclette! I always look forward to autumn just to make this recipe, and it’s a nice break from the macaroni & cheese recipes that use it pureed in the sauce. Squash works so well in macaroni and cheese, doesn’t it? This sounds delicious and a great way to sneak in some extra veggies. What a great way to use squash in a recipe. Mac and cheese is such a great comfort food…perfect for this time of year. You did a great job with the Thanksgiving guide! All recipes look delicious and creamy macaroni is a dish that anyone would love eating! I love mac & cheese as a Thanksgiving side! And the Boursin Garlic & Herbs cheese sounds absolutely divine in mac & cheese! I’ve never tried it but it sounds awesome. This recipe looks wonderful! Love the cheese combination and butternut squash….. YES! I hope you love it Martyn. This is one of my favorite ways to eat Mac & Cheese! I love that you added butternut squash to this recipe! It’s my favorite! I love it too, Michelle. It’s what makes this recipe so wonderful and balances the rich cheeses nicely! MacKenzie – this sounds so freaking good. I love the three cheeses you’ve used — and I ALWAYS have a package of Boursin in my refrigerator. I am so making this!!!! I hope you love it Lisa! I love sneaking in extra veggies like this! And you can’t say no to a delicious bowl of mac n cheese like this one. Looks so creamy and drool-worthy. I must try it! You and me both! I’m always looking for more ways to add veggies! I love it Amanda! I hope you enjoy the recipe. This is one of our all-time favorites in this house! I’vebeen looking for the TJ’s recipe for 5 years! Do you remember what else was in their recipe?